Choosing to stay here was a little bit of a calculated risk. 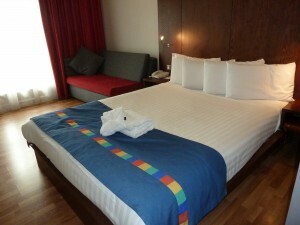 I’m an avid fan of Radisson Hotels, having stayed in numerous different ones over the years. The Park Inns are a “watered-down,” “low-fat,” “sugar-free” version of the chain and I was confident things would be fine. Upon arrival, my first impressions were not great. The most notable features that caught my eye were the car park’s overgrown grassy borders and the plethora of safety deposit style parcel collection lockers, which certainly lowered the tone for me. Check-in was fine, or at least I thought it was until I arrived in my room. Despite specifically requesting a room without an adjoining door, that’s exactly what I got, so it was an unnecessary and frustrating return to reception for me. Incompetence on that level is hard to fathom, which makes me wonder if people do things like that on purpose for a bit of sport?! Given the room rate, my expectations were already ‘managed,’ and the offerings were in keeping with both. Having said that though, the room was clean, it had a decent modern TV and despite the laminate floor, (which I despise), on the face of it was well presented. Like most things in life, once you begin to look a little deeper, you begin to notice a little more detail. Little details, if isolated are nothing more than little, but if numerous, they become the norm – I guess a little like the “Broken Window Theory“? Some of these details were the obvious missing knobs off the shower and the phone which had been adapted in some way, (obviously without caring what it ends up looking like), supporting the unloved and low-cost reputation with which I will now pre-judge all Park Inns by. The carpets in the public areas all seemed to be brand new, which was a welcome feature, it’s just a shame they didn’t extend to the rooms. The proximity of the hotel to the M6 motorway will be seen by many as a positive feature, but I’m guessing that an equal quantity of guests may not share their point of view. The hotel is literally in the shadow of the M6 raised carriageways running through Walsall. The food served in the on site restaurant was pretty poor. I had a pizza which was barely cooked, but given that the time it took to arrive and the degree of my hungriness were directly proportional, I decided to eat it rather than return it. Without asking though, it was removed from the bill, because the waitress said that “it didn’t feel very warm on the plate”. She also refunded the price of a pint of Guinness, (which I didn’t drink), because it was so disgusting – so I wasn’t having much luck food & drink-wise. To be fair the waitress was very good and had a lovely manner, which always goes a long way to lightening the mood. The two ladies running breakfast were great. They were a breath of fresh air and were greeting regular customers by name. My colleague and I were made to feel very welcome by them both. Breakfast was a simple hot and cold buffet, and was included in the price too. I’m not keen enough to collect a few Carlton loyalty points to want to return to this, (or any other) Park Inn, anytime soon. Why should I assume any other Park Inns are any different? If you want a cheap and cheerful hotel in the Midlands at approximately half the price that I paid in this hotel, check out my review of the IBIS Budget Hotel, Birmingham, by clicking the link here.